eastmans chicken and rib platter it serves how many people? Hi Yolanda, thanks for getting in touch. 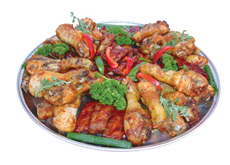 Our Chicken & Rib platter serves a total of 10 people.